When you ask native Charlestonians, local history buffs, or architecture fans which 'lost' building they lament the most, many of them answer the Charleston Orphan House. The institution itself was a source of pride for the city for many generations and as a municipal endeavor, is another in Charleston's long list of 'firsts'. It's difficult to imagine how such an imposing structure met its demise in the city that founded the nation's first efforts of historical architectural preservation, but one need only look back on others such as some of Charleston's finest hotels to realise that demolition was not always preventable, even here. Perhaps you've never even heard of the first public, city-run orphan house in the country, or maybe you didn't realise that it was right here downtown on Calhoun Street for 160 years. Have we piqued your interest yet? 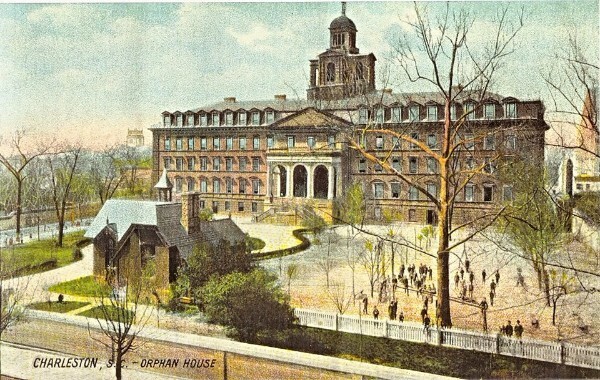 Postcard of the Charleston Orphan House (undated) as it appeared after the 1850s remodeling. The campus was actually surrounded by an eight-foot high wall with iron gates, not the partial enclosure of the picket fence shown here. Shortly after Charleston's incorporation in 1783, the city took it upon itself to care for the poor and homeless children left bereft by the Revolutionary War, a task heretofore assigned to the churches. At first, the city paid to house these "little wanderers" in private homes and boarding schools but this soon proved to be a very expensive endeavor. Plans were made to build an orphanage similar to the recently established private institution down in Savannah--Bethesda, the first orphanage in the United States. In 1790, City Council passed an ordinance establishing an orphanage "for the purpose of supporting and educating poor orphan children and those of poor and disabled parents who are unable to support them." Until a centralized campus could be built to house the children, a large house on Ellery Street off of Market Street was provided by Mrs. Eliza Pinckney to house the small children. When George Washington came here in May, 1791 on his Presidential Southern Tour, he visited the children there and "expressed great satisfaction at the establishment of such an institution, and invoked a blessing on it and its little inmates." As these temporary lodgings were located near the Sailors' Home, exposing the innocent to Lord-knows-what, securing a site and plans for a building became priority number one. 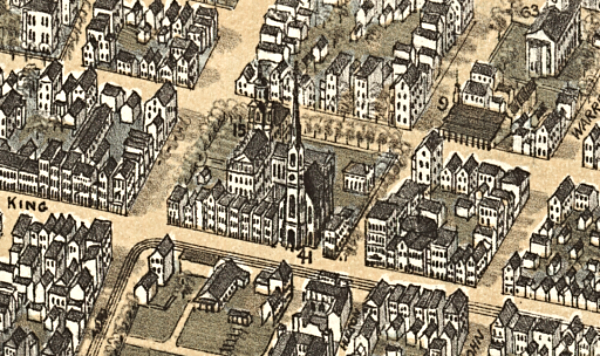 C. Drie's Birdseye View of the City of Charleston, 1872. The massive Charleston Orphan House (15) is set back from and facing Calhoun Street, and the Orphan House Chapel behind it faces Vanderhorst Street. St. Matthews Lutheran Church (41) faces King Street. Several considerations went into securing a site for the new orphan house, not the least of which was size--this was going to be no small endeavor as the intention was for the campus to fulfill all of the residential and educational needs of the children. The large tract on the corner of Boundary (now Calhoun) Street and St. Phillip Street was previously the site of Revolutionary War barracks and could now be used for peacetime purposes. This location would keep the children away from the temptations of the city as well as keep the citizens protected from any mischievous activities of an occasional "wild child". Funds were raised from public sources as well as private gifts (one man contributed sixteen turkeys and sixteen geese); collections were taken up at nearly every Charleston house of worship. The cornerstone was laid in 1792 by John Huger, the current intendant (mayor) of Charleston and the Chairman of the Board of Commissioners of the Orphan House. As a matter of civic pride, City Council denied the request that the gesture be made by the state governor; the tale that the cornerstone was placed by George Washington himself is just plain silly, clearly the result of someone getting their stories mixed up. The Charleston Orphan House was Charleston through and through from the get-go. At the opening ceremonies on October 18, 1794, the crowd was too large to fit into the massive building, so two sets of speeches had to be made so that everyone could hear--one inside and one outside. Charlestonians made generous donations at the ceremony, and did so every year thereafter at the anniversary celebrations. The original building re-used bricks from the old Revolutionary barracks and used wood from the mills of Thomas Bennett, a local merchant who designed and built the structure. Labor was done primarily by Revolutionary War veterans. It stood four stories high with a center block of 40 x 40 feet and two wings, each 65 x 30 feet. Set back from the street to the middle of the block, facing Calhoun Street, it was the largest building at the time in the city and a magnificent source of civic pride. The campus took up nearly a full city block, bounded by Calhoun, St. Philip, and Vanderhorst Streets and the grounds included playing fields and vegetable gardens. Plans for building a wall around the compound were begun even before the building was erected, but several years went by after the Orphan House opened before a wall was finally constructed. Unconfined, children would sometimes leave the campus for days at a time. Charles Lining, chairman of the Board of Commissioners at the time, said that "some of the children of the Orphan House frequently go about the streets and impose upon the citizens by informing them that they are in want of victuals," (even though the children were reportedly well-fed) and to the horror of the commissioners, neighbors of the Orphan House would believe and then feed them. A lottery was used to raise money shortly thereafter to construct an eight-foot tall wall around the grounds. Part of this wall is still standing and can be seen from Vanderhorst Street on what is now part of the College of Charleston campus. The Charleston Orphan House Chapel (1802) at 13 Vanderhorst Street, photographed in 1940 by C.O. Greene. The building was destroyed in the 1950s. The copula of the Orphan House can be seen behind the chapel. HABS, LOC. From the beginning, children of the orphanage were expected to engage themselves with teachings of the church in order to develop strong moral convictions. For the first few years, this involved ushering the children around town every Sunday to attend services at alternating churches. This proved to be quite an arduous task--can you imagine a hundred little kids walking in duck-like single file down King or Meeting Street to then be squeezed into church pews and expected not to disturb the service? It didn't take long to raise donations to build a chapel so that the children could attend services on campus and hear a rotating clergy. Gabriel Manigault, the lauded local amatuer architect, designed the simple Greek Revival building and it was opened for services in 1802; the opening sermon was delivered by Reverend Richard Furman of First Baptist Church. The free-standing building, 65 x 40 feet, was at the rear of the property and faced Vanderhorst Street. It housed three different organs over time; for the one purchased in 1839, the floors of the balcony had to be lowered seven inches to accommodate it: those must have been some mighty fine pipes! A Union soldier stands guard outside of the Orphan House, which was used as a Union hospital during the Civil War. Note the statue of William Pitt inside the wall, which was displayed at this location from 1808-1881. Charleston, SC Orphan Asylum, 1865. Civil War Photograph Collection, LOC. When the Orphan House was constructed, it was the largest building in the city at the time--larger than the Exchange Building or the Customs House--but because it was charitable institution, it was not designed to have ornate or elaborate detailing. The only decoration was a small cupola, which housed an alarm bell. All of that changed when the building underwent massive renovations from 1853-1855, an expansion necessary in order to house a growing number of children. The new building was designed by Edward C. Jones and Francis D. Lee and it more than doubled the size of the orphanage: the new building enclosed the old one on three sides--the front (south) facade as well as the east and west wings--expanding the space and adding the fine Italianate detailing that most of us associate with the Orphan House today. Most remarkable is the elaborate octagonal structure supporting the belfry, cupola, and the statue Charity (the remains of which can be viewed on display today at the Charleston Museum). The children stayed in the newly constructed Almshouse during the renovation period and were moved back into the orphanage just three days before its 66th anniversary. The celebration and parades were massive that year! During the Civil War, for their protection the children were removed to a former ladies seminary school in Orangeburg, where they were spared Sherman's march of destruction although most of the city was destroyed. (After the war ended, that same school campus was purchased for a college for African Americans: Claflin University, est. 1869.) The Charleston Orphan House was utilized as a hospital for Union soldiers while the children were away; when the children returned, life in the Charleston Orphan House--like in the rest of the South--had some significant changes coming. Curious about life inside the Charleston Orphan House and the importance the institution played in the development of the city and some of its most successful citizens? Stay tuned for the next installment! John recently represented the buyers in the sale of 59 Vanderhorst Street. The Radcliffeborough neighborhood is an eclectic and lively area downtown with a mix of architectural styles. Named for Thomas Radcliffe, who purchased and surveyed the land that now makes up the neighborhood, Radcliffeborough is bounded by King, Calhoun, Rutledge and Morris Streets. Close to the College of Charleston, MUSC, and fashionable upper King Street, this is one of the most convenient spots downtown. John recently represented the buyers of a lovely Charleston single style home in the heart of Radcliffeborough, just a couple of blocks from the former location of the Orphan House Chapel. Congratulations to the fortunate new homeowners...what a beautiful home!